September 24, 2015 – Nutrition.Health.Life. Creamy Fall Pasta with Squash, Onions, Kale, and Goat Cheese! I know I’ve been MIA – per my usual routine of being really excited about blogging, followed by an overwhelming about of work to do, and ending with complete neglect. Well, I’m back. At least for this one post. I am on a lighter rotation right now and was able to make a more involved, delicious dinner last night that I’d felt I needed to share with the work. 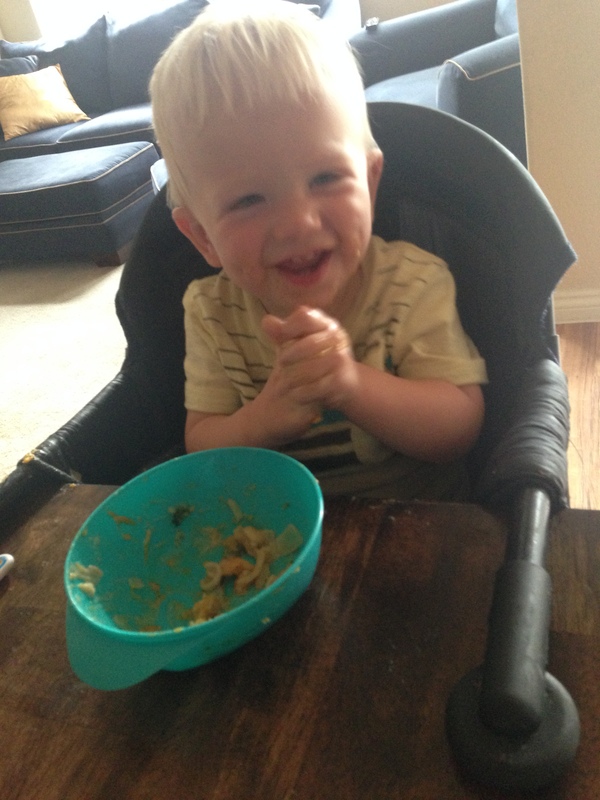 Eli agreed, this dinner was hands-down delicious! He was picky all day and wouldn’t eat anything but bananas (or nanas as he calls them now). I placed a bowl of this goodness in front of his screaming face and viola! he was silent. It was glorious. The end result was one super happy (and messy) kid. I am looking forward to when he figures out how to effectively use his silverware; until then I’ll deal with the mess since that means he’s actually eating. Peel butternut squash cut in 1/2 lengthwise. Remove the seeds. Cube squash and place in a sprayed cooking dish. Dice the onion and kale. Add to the cooking dish. Roast for 45 minutes, or until squash is fork-tender. Stir part-way through to prevent burning. Create a slurry (white sauce) by adding 2 tbsp to 1 cup of milk. Whisk well to completely dissolve. Add the remaining flour and milk, whisking while adding. Pour into a sprayed frying pan (not heated yet!). Place the pan over medium heat and stir continuously with a rubber spatula to prevent sticking. Add spices while stirring. Continue to stir until the mixture just starts to bubble. Add the goat cheese and continue to stir until melted and fully incorporated. Add pasta and roasted vegetable mixture to a pan. Pour white sauce over and stir completely. Enjoy!